The field proven Airborne Power® UPS line is ideally suited for military,industrial, medical and telecommunications applications requiring high reliability, ruggedconstruction, compact size and light weight design. These units are equallysuited for use in shipboard, airborne, vehicular, field deployed or fixedlocations with controlled or uncontrolled environments. The"
ETI0001-1240" is being used by the US Air Force ECMO Cart project becauseof their stringent performance and reliability requirements. The heavy-duty chassis,occupying only 3U (5.25" high) of rack space and 18.5" depth, has rounded metal cornersand rugged handles front and rear, aiding in safe handling. The companion 2U(3.5" high) Battery Expansion Modules are designed to be daisy chained to bring the backuptime to 4 hours in the typical configuration. In the typical ECMO Cartapplication, the base UPS unit and up to four Battery Modules are mounted in thelower underside section of the patient cart. Both module chassis are constructed of brushed aluminum to minimize overall weight. Internally, all majorcomponents are well secured and electrically insulated to prevent damage due to shock andvibration. The internal shieldedinput transformer provides galvanic isolation with provisions for domestic (115 VAC, CONUS) and optionally for international (230 VAC, OCONUS) inputvoltages. 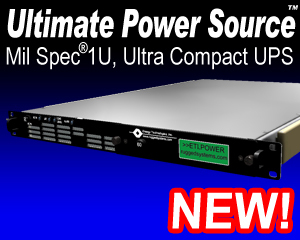 Special EMI/RFI filters and input power factor correction minimize both input current and harmonics. This specialtransformer and filters result in ultra low input leakage current required formedical applications. The unit also operatesas a frequency converter, taking 46-440 hertz input and converting it to clean,uninterruptible 60 hertz power. The input switch and the galvanic isolationtransformer all provide a double pole isolated source forsystems or locations where phase references and grounding are notconsistent. For scenarios that need hospital grade power immediately andno AC source is available to run the UPS, the Cold Start pushbutton allows the unit tostart and run from itsbattery modules before external AC is available. The LED arrays keep theoperator informed as to the unit's status including load and battery levels. Thehigh intensity audible alarm can be heard in high noise environments. All controlsand protective devices are brought to the front and rear panels with critical switches having fingerguards. Further, all front panel devices are recessed to prevent damage or accidentaloperation. Variousoptional power distribution controls are available which mount on the front panel orremotely. The rear panel provides a lockingconnector for the input power and six hospital grade NEMA 5-15R output receptacles. Multipleinput and output power panel options are available. Removable and washable air filters and a high capacity stainless steel ball bearing fans provideadded protection in both controlled and hostile environments. The exhaust air is diverted out the frontvent, with alternateair flow directions optional. The "
ETI0001-1240" has the added benefit of havingboth an internal battery and external battery expansion modules. The externalBattery Modules can be field replaced without having to shut the UPS down. Thisallows the backup time to be extended even further. The optional BatteryCharger/Conditioner (which has aircraft and global input capability) is usedto maintain the spare Battery Modules in ready condition at all times. The batteries are maintenance free with immobilized electrolyte and are constructed of flame retardant materials. For more information, see the Battery Technology section. The Status connector provides aninterface with optional computer software providing loss of AC and low battery status as well asremote shut down capability. ETI0001-1479for a version of this UPS with an integrated PDU and remote control. Overall, the Airborne Power line is uniquely qualified for criticalshipboard, vehicle, airborne or land based systems combining advanced modular designfeatures with highly reliable construction.